Get rid of those annoying box elder bugs in your home or business with box elder bug control services from Green T Pest Control. These bugs often swarm on homes in the Chicagoland area during the fall months (and also spring) and search for ways to enter your home. 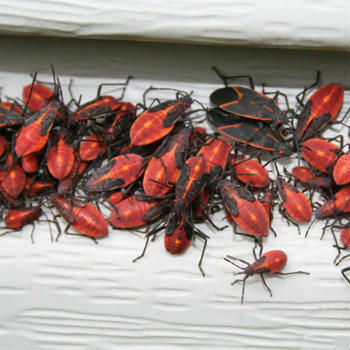 We can help treat your home exterior and interior to destroy box elder bugs and keep them away. Box elder bugs are about 1/2-inh long. They are black colored with three red stripes and have vertical edge lines on their bodies and red lines on the edges of its wings. These distinctive markings make it appear as though the wings form an upside-down V when they at rest with their wings flat. Most of the time you won’t really notice box elder bugs around your property until the fall months. During the summer the insects will be feeding in trees and you won’t see them often. In the fall you may notice swarms of box elder bugs on your home. Because they are sensitive to temperature, they will often seek out the sunny side of your home as the warm summer temperatures begin to cool in autumn. After large masses swarm they will search for places to spend the winter, which can include your home interior. The bugs will push themselves into cracks and spaces on home exteriors or come through windows and cracks around doors. 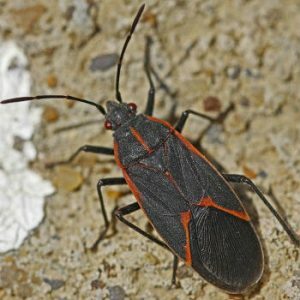 What Attract Box Elder Bugs? Some houses and building are very attractive to box elder bugs because they receive a large amount of exposure from the sun. Box Elder Bugs are especially attracted to buildings with a large southern or western exposure. Sometimes homes that are taller than surrounding ones or that lie on open flat ground attract large numbers of box elders. As their name indicates, box elder bugs are attracted to box elder trees. 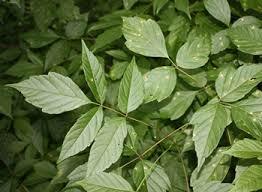 They are also big fans of silver maple and ash trees. These trees on or near your property can attract large numbers of box elder bugs because they feed on the sap and lay eggs in the branches. *Don’t smash box elder bugs in your home. They emit an odor that attracts more box elders and they can also stain walls and surfaces. Get rid of box elder bugs with help from Green T Pest Control!